Rob Wijnberg (1982-) is a Dutch philosopher and journalist with a flying carreer. Before reaching the age of 30 he was editor in chief of a part of one of the Netherland’s major newspapers. His work as a journalist has made Wijnberg increasingly critical towards media and the news. In previous books he philosophically explained his objections, his latest book is more like a manifest for new journalism. 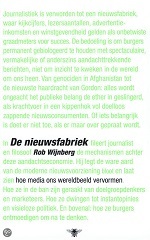 The title of the book translates as “the news factory” which shows accurately what Wijnberg tries to tell his readers. News is selective and interpreted information. It is never about what is normal, so it does not tell the consumer about the world, but about exceptions. What is worse, news is increasingly subject to commercialisation. A newspaper is no longer to inform people about important subjects, but to sell advertisement and the advertisers have a big influence on how news is presented, because you are not going to aim for a middle class by combining the advertisement to extremely scholarly essays. When looking at television you can notice that news has become entertainment. Many items talked about in news programs and bring little to our understanding of how things are. Also the audience has such a short attention span, that news has to be short. Because is has to be short, it can only repeat what is already known, because in 30 seconds of a news program or 400 words in a newspaper one simply cannot describe and substantiate alternate views. Then there is the point that news has to be fast and easy. There is a race who brings news earliest and in this race media has to “have an opinion first, think later”. Wijnberg’s book is not large, but gives a lot to think about. I share many of his views on news and media, so I am glad that Wijnberg ends his book with some sort of manifest for new journalism and he is going to try to execute it too. If all goes as hoped, “De Correspondent” (‘the correspondent’) is going to daily, but beyond the issues of the day and bring things in a framework and looked at from different viewpoints to make then understandable. I hope this is going to work out well, since I have stopped watching most of what is on TV a long time ago, news on commercial TV stations has been crap for a long time, but also news on our public chanels is increasingly filled with non-news.